Light up your week with some Maverick traditions of a parade, basketball game, fellowship, and more for Homecoming 2015 festivities in Maverick Country. 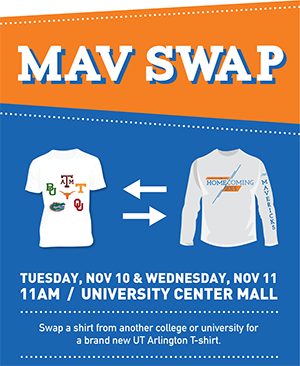 Exchange an old school T-shirt for new Maverick attire 11 a.m.-1 p.m. Tuesday-Wednesday, Nov. 10-11, on the University Center mall. 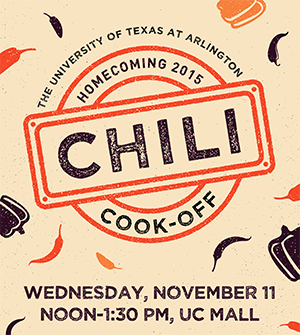 Enjoy the Chili Cook-Off noon-1:130 p.m. Wednesday, Nov. 11. Attend the Distinguished Alumni Awards before heading to The Bash on Thursday, Nov. 12. Cheer on the women's basketball team with the afternoon pep rally and trip to Waco on Friday, Nov. 13. The Lady Mavs face the Baylor Bears. See the story below for details. Saturday is filled with the 5K run/walk and a golf tournament, followed by reunions. Head to the College Park District for the pre-game street festival at 3:30 p.m. and The Party on the Plaza at 4 p.m. Cheer on the Homecoming parade at 5:45 p.m., and get loud at the pep rally before the men's basketball game at 7:30 p.m.
Thursday, Nov. 12, is the deadline to enter the Homecoming 5K and to reserve tickets for the Greek alumni and student leaders reunions and the Party on the Plaza. 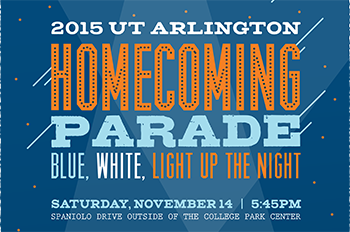 Order Homecoming event tickets online. Tickets to see entrepreneur Daymond John for the Maverick Speakers Series are available online. 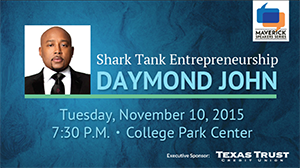 John will speak on "Shark Tank Entrepreneurship" at 7:30 p.m. today, Tuesday, Nov. 10, at College Park Center. An audience question-and-answer session and book signing will follow. An entrepreneur in every sense of the word, John is the CEO and founder of FUBU, a global lifestyle brand, and a pioneer in the fashion industry with more than $6 billion in product sales. He joined the cast of Shark Tank in 2009. John has received more than 35 awards, including the Brandweek Marketer of the Year, and was named Presidential Ambassador for Global Entrepreneurship by the White House in 2015. 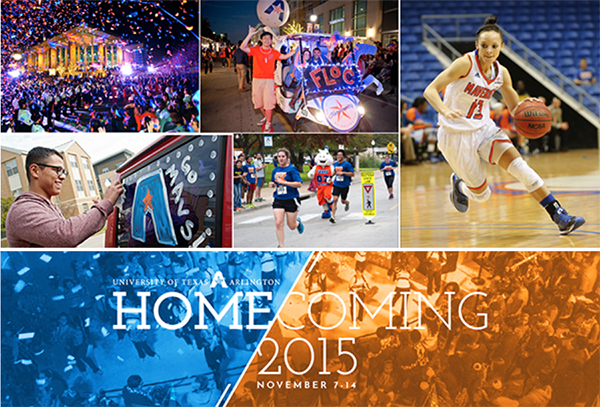 See the Maverick basketball teams in action for Homecoming 2015. The women's basketball team takes on defending Big 12 champion Baylor in the preseason Women's National Invitational Tournament Friday, Nov. 13, at Ferrell Center in Waco. The pre-game tipoff features food, activities, and a pep rally 1:30-3 p.m. at Moritz Plaza at College Park Center. The game starts at 6 p.m.
Drive yourself to the game and buy individual tickets for $5-10. Ticket packages that include transportation for the game are sold out. The men’s basketball team faces Fordham at 7:30 p.m. Saturday, Nov. 14, at College Park Center. Tickets are $3 with student ID at utatickets.com. UTA will honor its military men and women on Wednesday, Nov. 11, with a series of events celebrating Veterans Day. Reveille begins the event at 6:30 a.m. in the courtyard of College Hall followed by a wreath-laying ceremony. At 11 a.m, a ribbon-cutting ceremony opens the refurbished Vet Lounge in Room 216 of the Central Library. A reception for the inaugural induction ceremony for the National Student Veteran Honor Society is set for 2 p.m. in the Carlisle Suite of the E.H. Hereford University Center. RSVP for the Veterans Day reception to Kim Bennett at 817-272-9882 or kbennett@uta.edu. Donate a pair of socks for the "Socks for Service" project, which benefits homeless veterans. Drop off boxes are located around campus. 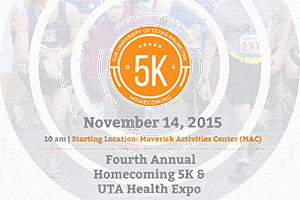 Pick up an "I Love UTA Veterans" or "UTA Veteran" button at the events. The Veterans Day activities are sponsored by the UTA Veterans Connection Committee. For details on resources for student veterans, go to the Veteran Services website. Read more about the Veterans Day events and honorees. 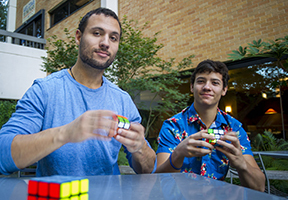 Business management major Anthony Brooks, left, always carries at least one Rubik’s Cube. He can solve the puzzle in less than 10 seconds, and often much less. He and his brother, Brian, right, belong to a growing corps of dedicated Rubik’s Cube enthusiasts who compete in “speedcubing” on an international stage. It’s a hobby he hopes will yield a career. Read more about Brooks' and his Rubik's Cube or watch the video. Parking for Maverick Speakers Series and Homecoming events will affect parking on the campus' east side Tuesday-Sunday, Nov. 10-15. Guests for the Distinguished Alumni Gala on Thursday can use lots F11 and 39. The first floor of College Park North and Park Central garages will close Thursday for parade vehicle staging. Park Central will reopen Sunday, and Park North will reopen Monday, Nov. 16. Parking lot F12 will be closed Saturday. Lot F13 will be reserved Saturday for parade dignitaries and VIP attendees. Spaniolo Street will be closed 9 a.m. Friday-midnight Saturday between UTA Boulevard and Third Street. Learn more about the MAVPark stickerless parking system at the Off-Campus Mavericks lunch and learn at noon Wednesday, Nov. 11, in the second floor lounge of the Maverick Activities Center. Representatives from Parking and Transportation Services will speak about the new parking permit system and answer questions from students. The lunch is free and open to all students. The Dining Services survey seeks to better understand the University community's dining preferences and satisfaction. At the end of the survey, choose to participate in a drawing for one of four prizes: a $150 gift card grand prize or one of three $50 gift cards. Live music and visual effects mingle for an original performance for the senses in Apollo’s Flight. Performances are 7 p.m. Friday-Saturday, Nov. 13-14 and Nov. 20-21, at The Planetarium at UTA. 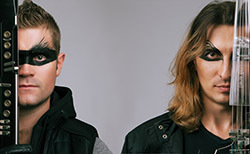 "Apollo, in Greek and Roman mythology, was the god of light, music, truth, the sun and prophecy, so it seemed fitting to name this multi-media concept after such an expressive character," Marek Eneti, who provides the original electronic music. Amy Barraclough, planetarium program coordinator, created light projections, electronic progressive live instrumentation, pristine sound, and spacey film footage to accompany Eneti's music. See the trailer. A larger version of the show will premiere Feb. 5 at the Latino Cultural Center in Dallas. Tickets are $20 for general admission, $15 for students with ID and children under 12. 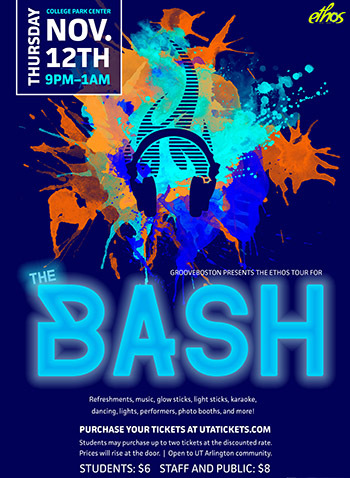 To purchase tickets in advance, call 817-272-1183. Faculty Chamber Recital Free. 7:30 p.m., Irons Recital Hall, Fine Arts Building. Music. UT System Day Wear your Maverick attire and celebrate UT System Day. UTA joined the UT System 50 years ago. Free. 11:30 a.m.-1 p.m., Palo Duro Lounge, E.H. Hereford University Center. Human Resources, UT System Day. Wind Symphony Concert Tickets.$9, $6 students, seniors. 7:30 p.m., Irons Recital Hall, Fine Arts Building. Music. Friends of the Library Julie Kibler, author of Calling Me Home: A Novel. Free. 7:30 p.m., sixth floor parlor, Central Library. UT Arlington Libraries, Friends of the Library. Faculty Bassoon Recital Laura Bennett Cameron, senior lecturer of bassoon. Free. 7:30 p.m., Irons Recital Hall, Fine Arts Building. Music. Volleyball Mavericks vs. South Alabama. Staff Appreciation/Senior Day; VB Club Team Night. Tickets $5. 1 p.m., College Park Center. Athletics. Trumpet Studio Recital Free. 7:30 p.m., Irons Recital Hall, Fine Arts Building. Music. 'The Man Who Came to Dinner' Classic comedy by Moss Hart and George Kaufman. Tickets $7 faculty, staff, students, seniors; $10 general public. 8 p.m., Mainstage Theatre, Fine Arts Building. Also, 8 p.m. Thursday-Saturday, Nov. 19-21; 2:30 p.m. Sunday, Nov. 22. Theatre Arts. Women’s Basketball Mavericks vs. Seton Hall. Tickets $7-20. 7 p.m., College Park Center. Also, vs. Missouri Valley College, Saturday, Nov. 28, Recover from Black Friday: Post-Game Autographs. Athletics. Concerts and Recitals Honors Recital, noon, and String Chamber Recital, 7:30 p.m. Monday, Nov. 30; UTA Jazz Concert, 7:30 p.m. Tuesday, Dec. 1; UTA Choir Concert, tickets $6-9, 7:30 p.m. Thursday, Dec. 3; Flute Studio Recital, 7:30 p.m. Friday, Dec. 4. Free, unless noted. Irons Recital Hall, Fine Arts Building. Music. Native American Heritage Month Lecture Author Paul McKenzie-Jones on prominent American Indian Movement leader, Clyde Warrior. 7 p.m., Room 101, College Hall. Native American Student Association, History. Current Research on Post-Traumatic Stress Disorder Panelists Alexa Smith-Osborne, associate professor of social work; Cheryl Anderson, associate professor of nursing; and Mary Kate Kenworthy, readjustment counselor for Veterans Affairs. 4-6 p.m., sixth floor parlor, Central Library. Veterans Upward Bound. Qualitative Research Brown-bag Meetups Yekang Ko and Ann Foss, assistant professors of planning and landscape architecture, "Measuring Climate Literacy: Using Survey Data for Interdisciplinary Environmental Education." Noon-1 p.m., Room 414, Central Library. Qualitative Research Meetup. Safe Zone Ally Training Register online. 9 a.m.-noon, Guadalupe Room, E.H. Hereford University Center. LGBTQA Program. Navajo WWII Code Talker Samuel Holiday Samuel Holiday, Silver Medal of Honor recipient and WWII Navajo code talker. Part of National Native American Heritage Month. Free. 7 p.m., Room 101, College Hall. Native American Student Association. Focus on Faculty Traci Freling, associate professor of marketing, "The Selective Generosity of Donors: How Victim Identifiability Affects Philanthropy.” Free. Noon-1:30 p.m., sixth floor, Central Library. UTA Libraries. The Sun Belt Conference announced its largest television package ever for men's and women's basketball for the 2015-16 season. 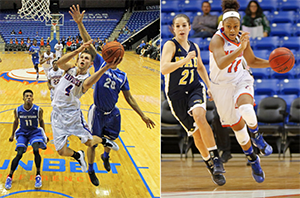 UTA's men's team has one game televised on ESPN2 and five on ESPN3. The women's team has three games on ESPN3. Read more about the televised SBC games. UTA's volleyball team rode its momentum to complete a two-game road sweep, downing Louisiana-Monroe 3-0 in Sun Belt play Saturday. The Mavs completed the season sweep after downing the Louisiana-Lafayette 3-0 Friday. The Mavericks, taking all six sets during the Louisiana road swing, improved to 18-9 overall and 9-6 in conference play. UTA ends the regular season by hosting South Alabama at 1 p.m. Sunday, Nov. 15, at College Park Center. • The Movin' Mavs Fall Tournament ended with a sweep by both the men's and women's wheelchair basketball teams last weekend at College Park Center. Competitors included Alabama, Arizona State, Auburn, Dallas Mavericks, DFW Freewheelers, Oklahoma City, and Oklahoma Rolling Thunder. Next is the Lady Movin' Mavs Home Tournament on Friday-Saturday, Dec. 5-6. • The women’s basketball game against the Baylor Bears in the 2015 Preseason WNIT Friday, Nov. 13, will be broadcast on Fox Sports Southwest Plus. • Women's basketball has a few changes this year. NCAA Playing Rules Oversight Panel approved revisions to start with the 2015-16 season. Read about the women’s basketball rule changes. • Golf coach Stuart Dean won the Yamaha Golf Cars/Lajitas Golf Resort Match Play Championship Oct. 26-28 at Dallas Country Club in Dallas. The win marked Deane's 10th NTPGA individual major championship and third Match Play Championship victory. Upcoming intramural sports deadlines are poker, Monday, Nov. 16; innertube water polo, Sunday, Nov. 22; 3-on-3 wheelchair basketball, Tuesday, Dec. 8; and college football bowl pick 'em, Sunday, Dec. 13.